Inspector, document is my design and artwork. Thanks. Credit scoring expressed by a numerical formula based on an analysis of an individual’s credit files to assess the creditworthiness of that person. A low score of 620 would suggest that there might be some degree of risk. This low score could affect the amount, the interest rate or even being able to obtain a loan at all. 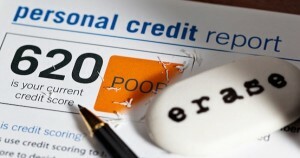 It is often possible to erase the historic data and improve the credit score by having erroneous data removed, as is visually demonstrated by the eraser.